Berger Bullets is now in the ammo business, offering high-quality, loaded ammunition for competition, hunting, and tactical applications. Berger will sell ammo through its new company, Applied Ballistics Munitions (aka “ABM” or “ABM Ammo”). See ABM’s ammunition offerings at www.abmammo.com. ABM Ammo will offer precision rifle ammunition for three popular cartridge types: .308 Winchester, .300 Winchester Magnum, and .338 Lapua Magnum. There are three product lines. The “Mission Ready” line is designed for military and tactical use. 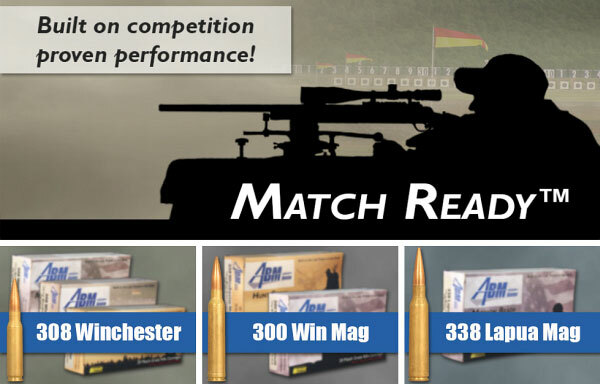 In addition, ABM will offer “Hunt Ready” ammo for precision hunters and “Match Ready” ammunition for target shooters. ABM uses high quality components and tooling to produce the most consistent ammunition possible. In a process developed by ballistics expert Bryan Litz, ABM ammo has been engineered and tested in the Applied Ballistics laboratory. ABM actually tests each individual lot of components used in the loaded cartridges to ensure quality and consistency. Eric Stecker, President of Applied Ballistics Munitions relays, “Launching an ammunition company in today’s firearm market environment has been a challenging experience. The product will speak for itself among the shooters as to why it is so important that we pursue this effort.” To learn more about Applied Ballistics Munitions, visit www.abmammo.com. Share the post "Berger Bullets Launches Applied Ballistics Munitions"
You could say shooting is in her blood. Raised in a home where national titles were about as regular as Johnny Carson on late night, it was only a matter of time until Michelle Gallagher won a National NRA Rifle title of her own. Or, as is the case this year, a fourth National NRA Long Range Rifle Championship. 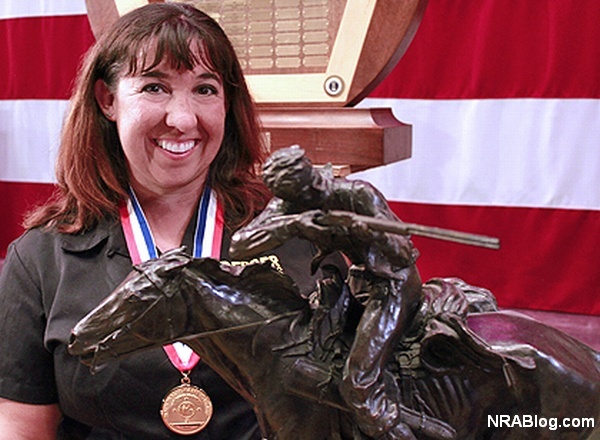 Michelle Gallagher with Tompkins Trophy for the NRA Long Range High Power Rifle Championship. Though the desire for a jacket was strong, the switch from smallbore to high power didn’t come without complications. In fact, Gallagher admits to shooting with her eyes closed for the first six months. Soon the kick wasn’t so big. 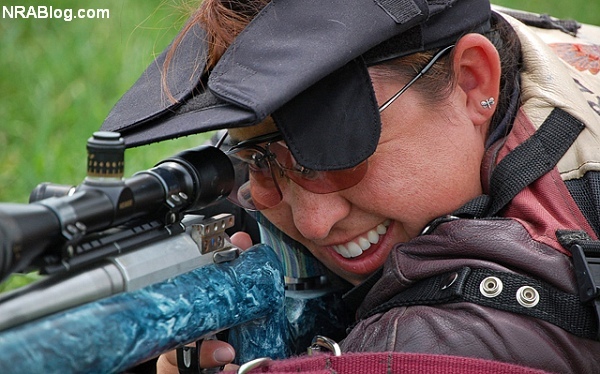 Using the skills she acquired in smallbore, Gallagher rose through the ranks until winning her first NRA Long Range High Power Rifle title three years later. With two more championships under her belt, she ultimately achieved her initial High Power goal in 2007 with a spot on the United States International Palma team. Gallagher doesn’t shoot much of the sling rifle these days. 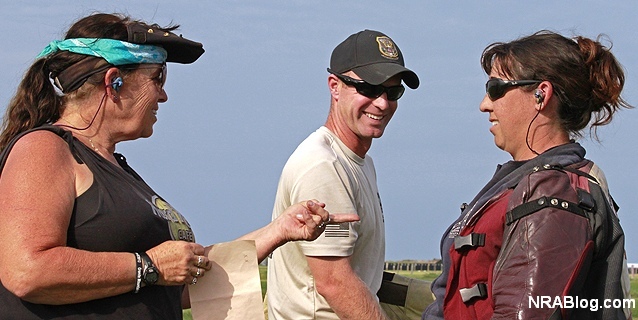 In fact, the last time she wrapped said sling around her left arm and sent a few shots 1000 yards down range was the 2013 NRA Long Range High Power Championships. Which begs the question — how did she manage to win without any practice? Now how does shooting on a bipod make you a better sling rifle shooter? Another part of Gallagher’s preparation that helps a lot is her relationship with her parents. World class shooters on their own, their status has changed from mentors to peers. An odd situation at first, the family eventually found a way to make it work. Michelle (right) gets advice from mother Nancy Tompkins (left) while SSG Brandon Green looks on. Share the post "Profile of a Long Range Champion: Michelle Gallagher"